The story of the Sealwoman with its reminder to return to the homeplace within stirs a memory. 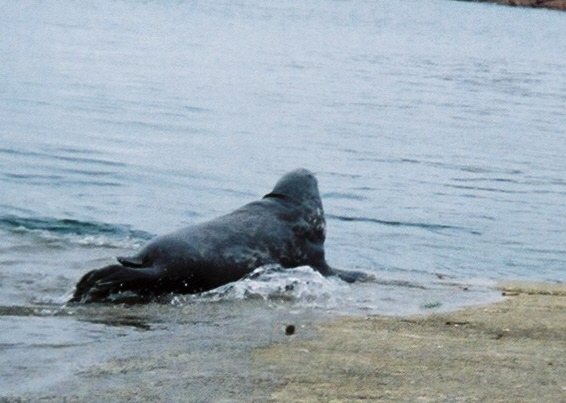 A large seal makes her way up the cement path that leads from the sea to the dock. I gaze at her and she holds my gaze. I have just disembarked from the ferry that makes its way between the islands of Mull and Iona. It is March 2010, and I am returning from the sacred storied island of Iona. I came here with the encouragement of Fionntulach, leader of the Ceile de, an ancient order that began in Ireland in the early years of Christianity. Two days earlier in Edinburgh, I had met Fionntulach at the city’s annual Interfaith Festival. Over an evening and through the following day, I listened as Fionntulach taught through stories, songs, dance and ritual. I learned that a remarkable change happened among the Druids, the priests of the ancient Celtic religion in Ireland, somewhere around the time of the birth of Christ. There arose among the Druids a group who became known as the Strangers. They spoke out against the ostentations, the warlike behaviour that had characterized the Celts for centuries. They dressed simply in linen, wandered through Ireland, seeking hospitality wherever they were, teaching a new consciousness. They told stories of a Holy One who would be born of a Virgin, One who would initiate a new time of peace and love. These Druids, who separated themselves from the others through their belief in one God of Love, grew into what became the Ceile de. As spouses of God, they married the inner mysterious force within themselves, dedicating their lives to working for God. The ancient order of the Ceile de has endured since the early centuries of Christian Ireland. Fionntulach’s life is devoted to restoring its teachings as well as to the ancient practice of inviting others into a form of membership in the Order. There are small associate Ceile de groups forming now in the British Isles and in North America. When Fionntulach herself discovered the Ceile de, its remaining members were elderly. Today only Fionntulach and Mary, who was with her Edinburgh, continue to travel and teach. In the long tradition, the order has had no fixed abode, (Mary and Fionntulach each live in their own small cottage in Scotland), no written rule, no dogma. The early members would choose a hut in the woods. Others would gather around them. They were known as “people of the land”, a community gathered by the vision of a founder around the transformative power of love, the love of God “too big for the head to understand, but not too big for the heart” Fionntulach explains.The only rule of the Ceile de is “Listen to and obey the Christ in your heart”. Fionntulach led us in the “Journey Prayer” from “Sacred Chants of the Ceile de”. We moved in a circle, hands over heart, then opened out to love, walking on the earth that knows and remembers us, making with our arms a waving motion as we integrated the dualities: light and dark, spirit and matter, masculine and feminine. Then we reached to heaven, drawing it to earth, giving birth, and honouring the child born of the dualities. We sang the words: Oh God, bless every step that I am taking and bless the ground beneath my feet. Next week, we shall visit Iona together in the Sophiawakens blog. I have thought for 12 years, since I met you at Iona. I want to join. I’ve sang the songs ever since. Too broke and broke up to travel the world. May I join, and how? I am married, 69, and in wyoming. But your order has never left my mind, heart, and soul. Please contact me. The pull and reality is stronger than ever. Anita: I am not a member of the Ceile de. If you look them up on their website http://www.ceilde.co.uk you may ask them about your desire to join. They do have groups in the US.